NEW LISTING FOR 2019 - Welcome to Beauregard's Rest, an ocean front condo with 3 beds and 3.5 baths that sleeps six. The views from this condo are amazing with three separate oceanfront balcony's. On the main floor is the living room, dining area, kitchen, washer/dryer and half bath. The living room has a great oceanfront view with sliders out onto a deck. It also has a Smart TV with cable and a DVD player. The dining area seats six comfortably with two more at the kitchen counter. The kitchen is nicely equipped and comes with a Keurig coffeemaker. On the second floor there are two bedrooms, each with their own full bathroom! The first bedroom has a queen bed and sliders out onto a private ocean front balcony. It has a Smart TV and a full bathroom with a tub. The other bedroom has two twin beds, a Smart TV and it's own full bathroom with shower. On the top floor we've saved the best for last. This bedroom has a king size bed, a large Smart TV, a full bath with shower, and the most amazing view from your private balcony! At low tide you can see the Civil War Blockade runner CSS Beauregard about 50 yards off shore. It was beached there in by the Confederates in 1864 while under attack from Union ships and is still there to this day. We have dedicated parking spaces for two cars with one in the garage, an outdoor shower, and we're just steps away from a public beach access and white sandy beaches. It's an easy walk along the beach to the Carolina Beach boardwalk to the North and the Tiki Bar to the South. We provide two beach bikes, beach chairs, and a beach umbrella. If you've never been to Carolina Beach before you're in for a treat. 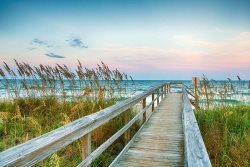 We're a wonderful family friendly beach town with pizza shops, ice cream shops, seafood restaurants, and a grocery store. You'll never have to (or want to) leave the island. During the summer there are free outdoor concerts and movies, a Farmers Market, and Thursday night fireworks, all within walking distance. Stroll the boardwalk, head down to the Kure Beach pier, visit the NC Aquarium or take in some local Civil War history at Fort Fisher. You can find new things to do every day or of course just relax on the beach and soak up the sun. You'll be glad you came to Carolina Beach and will want to come back year after year. David was very helpful and responded immediately when we had any issues. He was friendly and very accommodating. I would have no hesitation working with A1 Property Management again! The views were amazing!! The kitchen had everything we needed. All the basics we needed were there including paper towel, toilet paper, and cleaning supplies. And the place was sparkling clean. There were plenty of pillows and the beds were super comfy. The location is great!